Jolene Taylor can be heard as the voice of the streetcar in this video. Jolene Taylor insists the voice riders hear on buses isn’t really her. “I have no idea who that person is. It just sounds like some strange woman,” says Taylor, the customer relations supervisor for the Kansas City Area Transportation Authority. It may not sound like her, but there is no disputing that is Taylor’s voice. For roughly 15 years, the soft-spoken Taylor has been the voice of the Metro. She announces bus stops, rules for rider conduct, safety alerts and where riders can find route information. The same soothing voice that greets riders phoning the Regional Call Center will soon be the voice of Kansas City’s new downtown streetcar. It’s a professional voice, so calming that it can frustrate an angry caller who accuses her of getting paid just to talk nicely. At one point, her voice was so popular that one rider called the KCATA, claiming she was Taylor’s voice and wanted to be paid for making announcements. Taylor’s soft, hushed tones work well on the hustle and bustle of city buses, said transportation supervisor Tony Smiley, who oversees the recording sessions. Taylor recently went into the studio to record more than two dozen messages for the streetcar, which will start operating next year. It took about 90 minutes to record the messages, with some phrases needing five or six takes. Coached by a recording engineer along with officials from the KC Streetcar Authority, Taylor read a script of key phrases and messages that streetcar riders will hear. Taylor warmly welcomes riders to the streetcar while gently reminding them not to eat or drink and be on the alert for suspicious packages. Occasionally, Taylor eased off pronouncing some words and letters while emphasizing others so she could get the right balance. In some cases, she had to speak more relaxed or slow her pacing. On balance, Taylor was comfortable with her streetcar recording performance – but then again the final decisions will be left up to the communications staff at the streetcar authority. 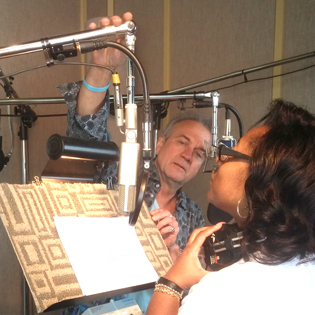 The voice work – for the streetcar and the bus – is a fun side to her job, something she’s shared with very few outside her family. She’s not about to let the demand for her voice go to her head. Although her voice may be heard by thousands every day throughout the city, she’s confident it would be hard to link the voice with her face. 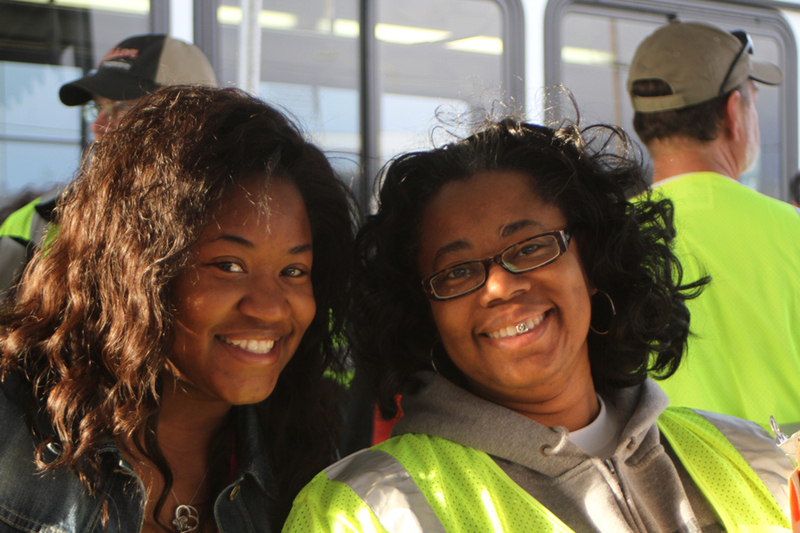 Jolene Taylor (right) takes a break from her judging duties at the annual Roadeo bus driving competition.